Disney Frozen Hairstyles Are Now An Exciting New How To Book! Ever since the release of Frozen, little girls want to be Anna and/or Elsa. The dresses are flying off the shelves, the movie is on constant replay and the music…. well the music is on 24/7. Now, in late October 2014, a new book will be released to help your child look even more like one of these characters! 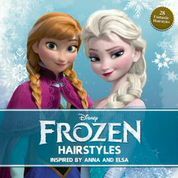 DISNEY FROZEN HAIRSTYLES: Inspired by Anna and Elsa (Edda USA; October 2014; $12.95) is a beautifully photographed book with illustrations of each style on a child so you can see exactly how it’s supposed to look. I was lucky enough to get a preview of the book and thought I would share it with you all. First of all, can I just say that the mix of colorful images of Anna and Elsa, mixed with real life images of little girls wearing the Frozen inspired hair styles is inspired. It’s one thing to see an animated character wearing a style you wish you could wear but to be able to see it on a real life person makes you realize you can achieve this look too! There are 28 hairdos in total in this book and they are broken down into different sections for different styles. This makes it much easier to get straight to the look you desire. There are 4 sections in all which include Braidschool, Twists and Braids, Updos and Buns, and Waves and Ponytails. I will admit that I am not a very good hairstylist. My sister is a hairstylist and every bit of that talented gene went to her. I am in great need of a book like this to help me create these looks. I found this book to be easy to understand and the step by step instructions, along with illustrations of each step, made me feel like I could accomplish whatever look I wanted. These looks are not divided into an easy or difficult type of categorization. I do think that some are much harder than others to do, however, with the steps provided I do think that even the most difficult looks can be accomplished with some patience. My favorite looks are Braidless Braid, Fit For A Queen, All Up In Knots ,Snow Queen ,and Roll the Ponytail, The opening Braidschool section is an excellent refresher on how to do some of the most popular braids that are used within the other styles throughout the book. This book is a must have for any little girl who is dying to be a Frozen Princess or Queen. The price is on point for a hard cover, illustrated book. It will make an excellent Christmas gift or just a little something extra for that special someone. I have a feeling I will be purchasing a few. As previously stated, you can check it out in bookstores later this month!